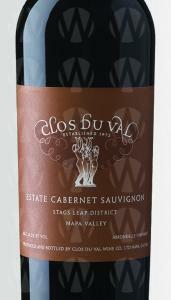 In 1972, Clos Du Val acquired 150 acres of estate vineyards in the heart of the Stags Leap District, and made its first wines, including Clos Du Val´s legendary debut 1972 Cabernet Sauvignon one of only six California Cabernets selected for the famous 1976 Judgment of Paris Tasting. Today, Clos Du Val´s acclaimed estate program has evolved to include vineyards in Carneros and Yountville. From this diverse palette of estate fruit, which includes 30 distinct blocks of Cabernet Sauvignon, Clos Du Val makes a small portfolio of estate-grown wines, with an emphasis on the exceptional Stags Leap District Cabernet Sauvignons that first catapulted Clos Du Val to fame. Grown by master Winegrower Jon-Mark Chappellet, and made by renowned Winemaker Ted Henry, Clos Du Val´s wines are recognized for their balance, complexity and vivid fruit. ; Experience the beauty of our estate distinctly Clos Du Val, quintessentially Napa Valley. ; Nestled within the majesty of the Stags Leap District, we invite you to visit our picturesque estate. Inspired by the iconic Three Graces Joy, Mirth, and Splendor that have adorned our label since 1972, we offer a warm and intimate tasting experience where good friends can gather to explore great wines. From the grace and grandeur of our renowned Cabernet Sauvignons to the vibrant allure of our estate-grown Pinot Noirs and Chardonnays, your wines await! ; For reservations, please contact us at hospitality@closduval.com, or 707.261.5212 to reserve your visit.